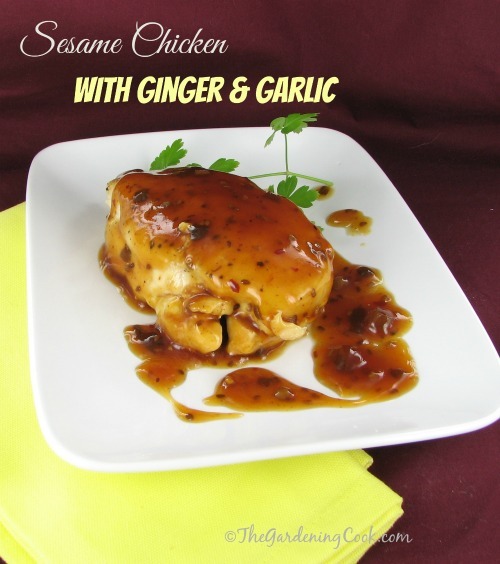 This toasted sesame chicken recipe has a sweet and tangy sauce with a hint of spice. The spice in the dish comes from the sriracha, a combination of red chili, garlic, vinegar and salt. You can get this sauce at Asian markets or online from my affiliate Amazon.com. (affiliate link.) The sugar, vinegar and tomato puree gives the dish a hint of sweetness. We had this tonight with freshly made herb bread and Brussels sprouts, but it would be lovely over any pasta too. In a bowl, whisk together the soy sauce, sriracha and sugar until sugar is completely dissolved. Add the sesame oil, ginger, vinegar, tomato puree, garlic, scallion and stir until well combined. 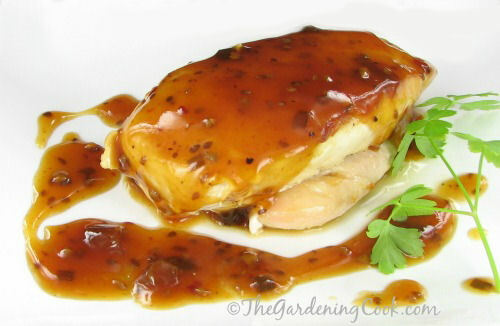 Remove the chicken from the marinade and reserve the marinade. Add the oil to a non stick frying pan and cook the chicken on both sides until cooked through, about 8 minutes per side. Remove and keep warm. Place the marinade in the frying pan and bring it to a boil. Cook for 2-3 minutes so that the marinade is well cooked. Add the arrowroot/water mixture and stir well until thickened. Return the chicken to the pan and coat well. Serve immediately.